Or target just those you desire. 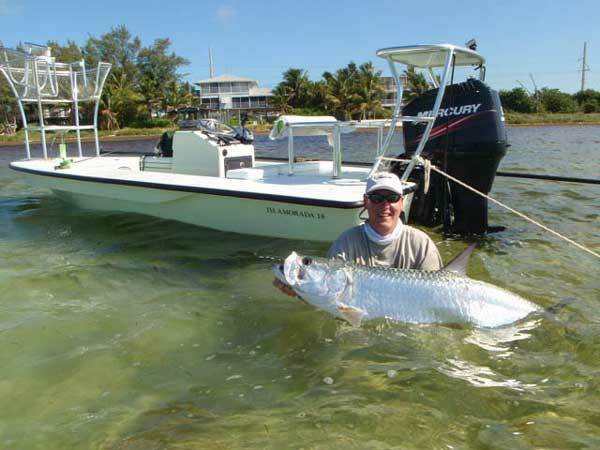 You can fish Florida Keys tarpon, bonefish, permit, snook, trout, redfish almost all year round – check my Seasons page to know what species are best during which months so you can plan your trip accordingly. Tarpon, the Silver-King, reaches record sizes of 150+ pounds. Whether on fly or live bait, there is nothing to compare with the excitement and thrill of sightcasting and fighting a tarpon, one of the greatest game fish in the world. A fly fisherman’s dream, standing on the bow, anticipating a hook up, watching tarpon cruise along lazily in three feet of water. You scramble to get a fly in front and are holding your breath while you watch it take your fly, turn it’s giant head and begin to streak away while your’re thinking you need to set the hook! And once set, it explodes like a silver rocket out of the water, shaking its’ head, trying desperately to break loose. Smaller tarpon provide an excellent light-tackle experience, jumping twice as much as the larger fish that are 100 pounds and up. Tarpon can be caught almost year round but March through July is the best. Bonefish is pound-for-pound the strongest fighting fish in the Florida Keys, reaching release record double-digit sizes of 14 pounds. The average weight is 6 to 8 pounds. Poling on tailing bonefish requires stealth-like pursuit. They can be very spooky at times, especially when feeding on the shallow flats. Bonefish will feed so shallow that their tails wave in the air as they forage the bottom for food which is the term known as “tailing.” They’re nicknamed the gray ghost as they are noted for their reputation of disappearing from sight in the blink of an eye. But when hooked, they take off so fast that 100 yards of line will vanish in a few seconds. Then you just hold on for rod-bending, drag-screaming action. Stalking tailing bonefish is a sport-fisherman’s greatest challenge. 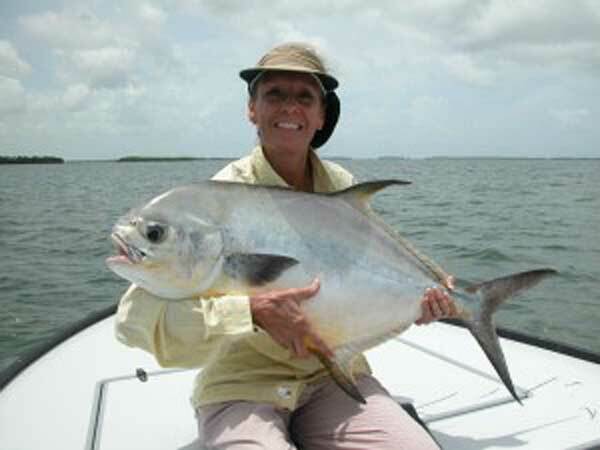 Permit are most commonly seen on the flats, feeding on their favorite food: crabs. Permit is the grand prize for fly fishermen sightcasting with crab flies. 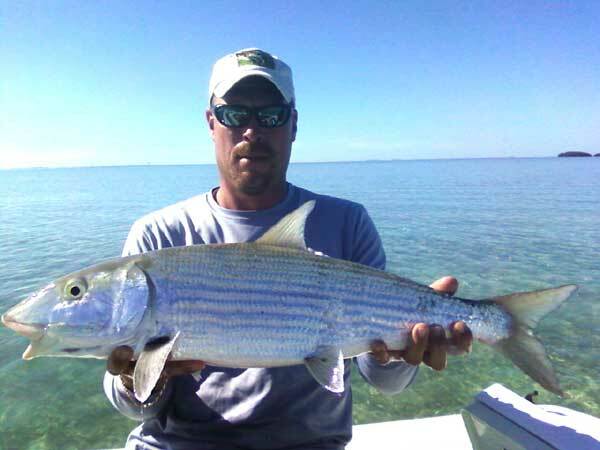 Like bonefish, permit will tail in very shallow water. You will need to step up to the plate when fighting these fish nicknamed the “freight train.” They average in size from 10 to 25 pounds, reaching as much as 50 pounds. This fish fights like a back-alley cat, cutting back and forth in the current and diving in the rocks to dislodge the hook. They will fight you all the way until the time of release, if you are so skilled and fortunate! 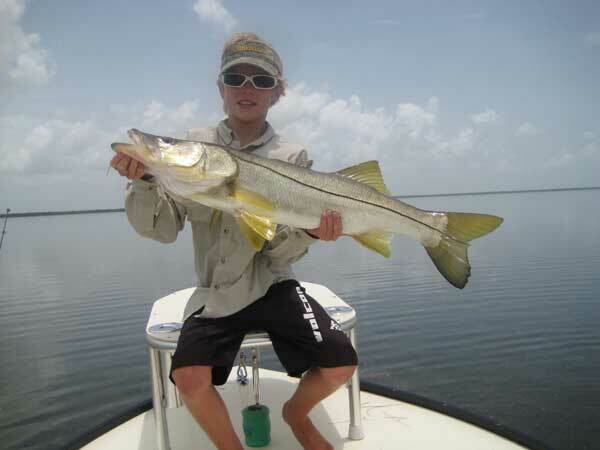 Snook is a hard-fighting game fish that inhabits the Florida Keys backcountry. The snook will lie deep within mangrove roots and underwater structures, waiting to ambush bait fish. This linesider will test your angling ability as it streaks back to it’s mangrove-root shelter seeking escape. Snook range in size from an average 5 to 10 pounds to as high as 25 pounds and can be caught sight-casting on the shallow flats and potholes. Snook fishing can be good year round. Trout travel back and forth in the deep channels and along the seagrass beds. Trout are plentiful and are a good top-water target species for those who prefer lots of action. Trout will take a wide variety of baits including live bait, jigs, spoons, crank baits and top-water lures. Redfish are caught around the many mangrove islands while roaming the flats, tailing in water so shallow at times that half of their body is out of the water, teasing you to try to catch them. 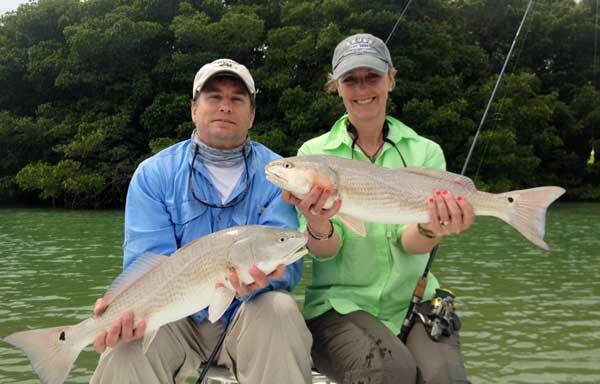 Redfish is a great target fish for beginner fly fishermen, sometimes allowing more than one cast at close range. Redfish are a much easier target to cast to than bonefish. The average redfish is 4 to 8 pounds, up to as much as 15 pounds. Red fishing can be good year round. So come on down to fish Florida Keys tarpon, bonefish, permit, snook, trout, redfish and more here in Capt. Larry Sydnor’s home paradise!